The Honorable Minister Louis Farrakhan will host his first ever #AskFarrakhan Social Media Town Hall Meeting live on Wednesday, September 26, 2012 from The Final Call Administration Building in Chicago, Illinois. This live event will allow people from around the world to engage with the Minister Farrakhan, one of the most prominent and controversial activists in American history. During the live webcast event, Minister Farrakhan will answer questions for two hours from Twitter, Facebook and YouTube users. A national team has been assembled to collect questions for the event. The questions will reflect geographic diversity and cover topics, including the Presidential race, youth, education, foreign affairs, media, religion, hip-hop, etc. The Twitter hashtag #AskFarrakhan has become very popular and Minister Farrakhan frequently responds to questions from his 80,000 plus Twitter followers. The town hall is the latest effort to use social media platforms to continue his mission in giving timely guidance. Ashahed M. Muhammad, Assistant Editor of The Final Call newspaper, will be serving as the moderator for the historic event. 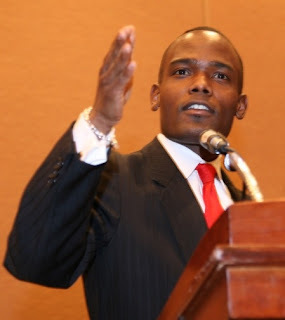 On Sept. 22, Ashahed Muhammad and myself appeared on "Liberated Sisters" radio show hosted by Charlene Muhammad. 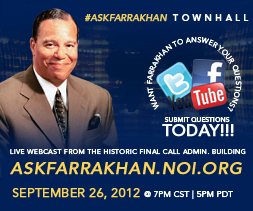 We discussed the upcoming #AskFarrakhan townall. Click here to listen to the archive of that interview. Ashahed Muhammad was also interviewed by Hurt 2 Healing Magazine (Link) and DericMuhammad.com. (Link). Be sure to share these interviews and watch the social media town hall!